Aside from being rather absent from the blogosphere, I have found myself using AutoCAD for Mac more and more lately. In fact, my company and I are preparing to host an AutoCAD for Mac training class in the next month. While the gap between the Mac and Windows releases of AutoCAD 2011 left me wishing for more, the 2012, and especially the new 2013 release dramatically narrow the gap between the two platforms. No matter how small the gap between platforms, a missing tool is a missing tool. Since AutoCAD for Mac was a complete rewrite, and the Express Tools team has long been dissolved, it only makes sense Autodesk chose not to port Express Tools to the Mac platform. Regardless of the incredibly logical reasons behind the decision, it still doesn’t supersede the frustration of a missing tool. I came across that very situation as I opened a drawing that was sent to me, and had linework drawn at many elevations. Express Tool users know the perfect solution to this problem is the FLATTEN command. 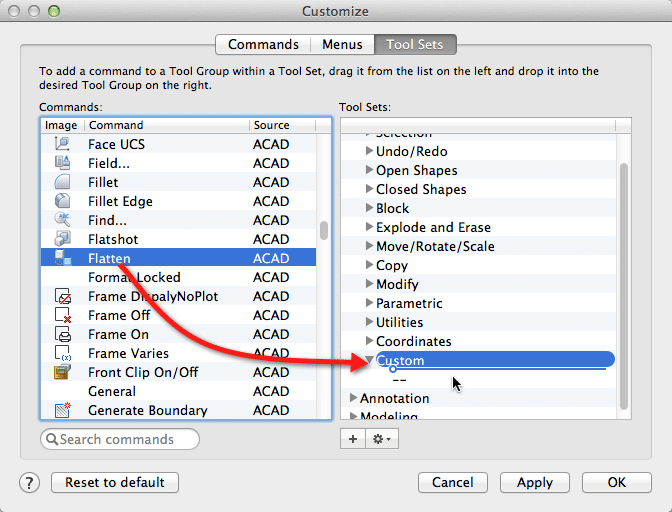 Trouble is, AutoCAD for Mac doesn’t have the FLATTEN command since its part of the Express Tools bundle. 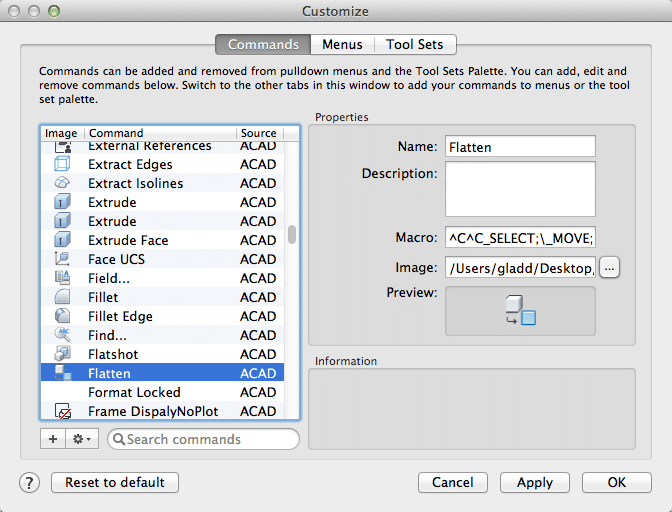 Inside AutoCAD for Mac, open Tools > Customize > Interface (CUI). From the Customize dialog, click the [+] button to create a new command. Within the Properties section of the Customize dialog; give your tool a name (i.e. 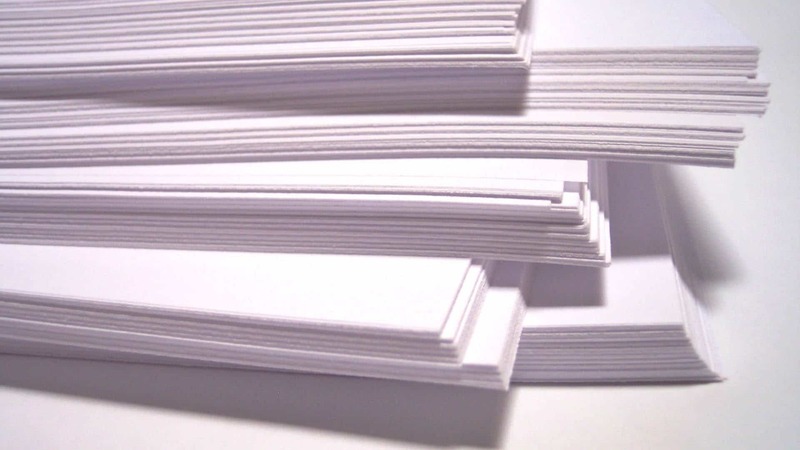 Flatten), and an optional description. Choose an icon for your new macro. Here’s the FLATTEN tool icon from the Windows version of AutoCAD. What the above macro does is moves the objects you select above the maximum range for AutoCAD which results in those objects being placed at the maximum height of 1e99. Now that all of the selected objects share a common elevation, we can move them down –1e99, and the final elevation will be 0. Put another way, the functionality of the FLATTEN command has been emulated through a Macro. Expand an existing Tool Set contained within the right-hand panel, or click the [+] button to create a new one. Locate your newly created macro within the left-hand panel. Drag-and-drop your macro into your Tool Set. Click OK to close the Customize dialog, and begin using your new Flatten macro. This command it is not working either for me. I am using Autocad 2017, have input all the information given above and still nothing is happening. I highly appreciate if someone has a solution for this. seems like that one worked out well … i am surprised ! thanks! Daniela’s edit on January 14, 2015 worked great, but only when I added a button and used that. I cannot use the “Flatten” Command. I assume that is part of using Macros? Anyway, I’m glad i can flatten even if I have to use the button. 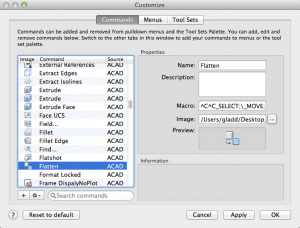 i´ve tried in Autocad 2015 for MAC but doesn´t work… any idea why? or solutions? 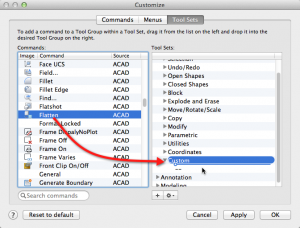 I have autocad for Mac 2016 and this toolset macro solution isn’t working… anyhelp? I tried this step for step but it didn’t work. I even used the revised macro but the program doesn’t recognize the command. Any thoughts? THANKS! Donnie’s macro didn’t work, but Daniela’s did (working in AutoCAD LT 2016 on mac). Still, thanks for posting this Donnie, between you & Daniela, wow, what a huge help! Is this suposed to work for autocad for mac 2011, too? This doesn’t create polylines from splines the way Flatten does in AutoCAD for PC. Do you have a work around for that? i can do SPLINEEDIT, but that only works one line at a time. I need something to do it en masse. Thanks. I’ve done this process step by step, it still says ‘unknown command’. Any ideas? I have AutocadLT 2013 for Mac – would the above process work for LT or do I do something different? or does it just not work? Hi, I’ve followed the 5 steps from above. I have my new too on my toolset. But, when I sty to use it it says “invalid point”?? Could you explain how to use it? Hi “Eminsua”, i don’t know why they have deleted this usefull tool, but there is a “homemade” solution. Just select the lines you want, then go to the “properties inspector” and the set the “Z” values to “0”. I hope that will help you.